ENCAUSTIC meaning, "to burn in", is an ancient medium using molten beeswax combined with dry pigments and natural resin. 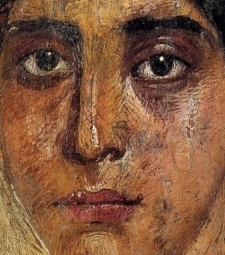 Greeks that settled in the Fayum region of Egypt adapted the funerary customs of honoring the dead by using encaustic to paint portraits of those past in the prime of their life, with some dating as far back as 23 B.C. The resilence and color remained intact, uncracked and unfaded over centuries due to wax's imperviousness to moisture. The Portraits were first discovered in the late nineteenth century. Encaustic is the oldest known pigment binder. When molten, encaustic paint can be applied to a hard substrate such as birch plywood with a brush. Each layer of wax is fused with heat using a heat gun, iron or blow torch to adhere to the surface and ensure stability. A COLLAGRAPH is a printing plate with collage applied to it. Plates are usually made of clear acrylic plexiglas, cardboard, paper board or mat board. Materials such as carborundum, acrylic mediums, fabric, textiles, bubble wrap, leaves, stencils, string, netting, wax and grass can all be used in creating the collagraph plate. The plate is then inked, using a cardboard squeegee, stencil brush, stiff paintbrush, or a combination and printed onto paper using an etching press. The resulting print is termed a collagraph. Encaustic white wax is used in place of or, in addition to, collage materials for creating collagraphs. Read the story of my development of the unique Encaustic Collagraph Printmaking technique which unites encaustic techniques with that of printmaking in this online article in EncaustiZINE. Using specially formulated Wagner Encaustic Collagraph White encaustic paint, fusing is optional in order to allow various intaglio textures of the wax to be exploited through the application of non-toxic soy and honey based Akua Intaglio Inks. Printing from the textures of my white collagraph wax using Akua Intaglio inks makes the perfect marriage of materials! The unique process of Encaustic Collagraph Printmaking combines the methods, techniques and tools of both encaustic painting and intaglio printmaking in lieu of using collage materials for creating a collagraph printing plate. The adherent and moisture resistant properties of encaustic along with its overall flexibility, make it an ideal collagraph printmaking material. The wax is conveniently packaged in a can so that you simply set it to melt within an hour on a hotplate or griddle. See further information and instructions on getting started with Wagner Encaustic Collagraph White by clicking on the product link. Tip: Using oil based inks is not recommended with this method. The boiled plate oil contained in oil based inks adheres to the encaustic collagraph causing the paper to stick to the plate. Encaustic collagraph "monoprints" can be created using various mark making techniques such as dry point etching directly into the plate and through the wax texture making it possible to use the plate again and again (up to at many as 20 pulls) varying the colors for small editions. The plate can also be enhanced, changed or completely re-created after making one unique print from it, this would be considered a "monotype" (one type). Typical tools for building the encaustic collagraph plate are ceramic incising and scraping tools. Heated tools, such as a tacking iron and a heated wax writer are recommended. With this method, fusing the wax is optional and not necessary. Since innovating this unique way of combining encaustic technique with with intaglio collagraph printmaking fifteen years ago, it has come to be known as Encaustic Collagraph. Over the years, I have enjoyed teaching, presenting and demonstrating this method to artists. The workshops have attracted students to my studio from all over the world to learn this particular technique and experience the many elements of surprise that come with pulling prints.